The frenetically paced director’s first five films, all made within an astonishing 18 month period. The pace continued as Fassbinder made more than 40 feature films in just over a decade. Criterion’s Eclipse Series is a box-set only selection often highlighting a director’s “minor” works, or, conversely, their formative ones; an appropriate alternative title could be the Ellipse Series. Because the DVDs are released on standard, non blu-ray format, and because they often come with few if any extra special features, a box set of four to six films often goes for the comparatively reasonable price of $59.99, approximately. For completists, Eclipse is an opportune chance to collect rare or newly re-mastered works from their favorite directors. The qualification system is mostly programmatic, a nice change from the primary catalogue: Some of the sets look at a director’s output in a specific era (Chantel Akerman in the ‘70s or Oshima’s Outlaw ‘60s); others by theme (Kaurismaki’s Proletariat Trilogy or Mizoguchi’s Fallen Women); others by genre (Malle’s Documentaries or Lubitsch’s Musicals). The most common grouping, however, is a to look into a director’s “early” or “late” period, evidenced by such sets for Ozu, Bergman, Kurosawa and, now ‘Early Fassbinder’. 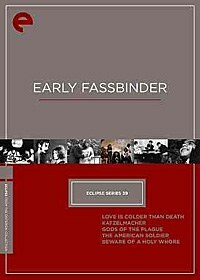 More than the standard Criterion Collection, the Eclipse Series is director-centric, with almost every catalogue number (Fassbinder is 39, btw) coming from a recognized auteu --- a director who established themselves as driving the majority of their artistic output, being the author, and often uncompromisingly so. ‘Early Fassbinder’ collects the frenetically paced director’s first five films, all made within an astonishing 18 month period. He burned the candle at both ends, as it were: the pace continued as he made more than 40 feature films in just over a decade, dying unexpectedly at the age of 37. There’s an expected desire to look at a director’s early works, especially someone as prolific and thematically specific as Fassbinder, and see how and if it portends some of their later triumphs. And while you can usually connect the dots if you try hard enough, there’s not always the most transparent through-line the way there is with, say, David Lynch’s surrealistic Eraserhead or Bergman’s austere melodrama Crisis, to name a few. For Fassbinder, the elements are all there, but disconnectedly so: a character’s fluid, undefined sexuality; manic creative pace supported by a rotating cast of regulars; playing with genre and nods to influential directors; dissection of modern struggle through character malaise. It’s not hard to see how The Marriage of Maria Braun comes from the same creator of The American Soldier, for example, even if the latter is much more uneven and unsatisfying; the elements were always there. Before his film work, Fassbinder founded Munich’s Antiteater (anti-theater), an ostensibly subversive theater group. This period informed his earliest films, such as 1969’s debut Love Is Colder Than Death. Partially out of financial necessity, somewhat as an aesthetic decision, Love Is Colder Than Death comes off mostly as a filmed play. The scenes are static and long, with few locations and mostly aloof performances of stilted dialogue. To be honest, it’s not necessarily the best indicator for what would follow. There are glimpses of brilliance. The film’s opening credits acknowledge Fassbinder’s influences through a dedication to “Rohmer, Chabrol, Straub”, and assorted other French New Wave elite. The trend of acting in his own films began in right away in Love Is Colder Than Death, with Fassbinder playing Franz, a small time hood who, at the behest of a local crime syndicate, is ordered to be killed by his friend Bruno. This noir/gangster tale is low on frills and pretty much anything else that could make it interesting. The story is meandering and glacially paced, mostly due to the infrequency of dialogue. The biggest takeaway is Fassbinder’s incomparable eye for composition and framing. There are single shots as beautiful as anything in his later oeuvre. Adapted from one of his earlier plays, Katzelmacher, a derogatory slang term for a foreign worker, once again finds Fassbinder starring, this time as the titular Greek laborer Yorgos. He upsets the balance on a group of disgruntled Munich friends who don’t have a lot of money, self-confidence, or ambition. It’s supposed to be a pointed critique of this particular social class, as their xenophobia of this innocuous foreigner stems from basically nothing. It works up until a point, even though it doesn’t take 90 minutes to convey its meaning. Like Love Is Colder Than Death, Katzelmacher is a bit of a chore to endure, mostly due to its languidity and repetitious setups; again, likely a result of financial constraints. What makes it worth a watch is the immaculate compositions and palpably chilly tone. It feels like more of an exercise than a fully formed thought, but it’s clear that the intentions were there from the beginning. This is the best of this early set, and marks a clear point from which Fassbinder was able to start utilizing his influences in a developing his own artistic synthesis. Love Is Colder Than Death and Katzelmacher are essentially tone poems with occasionally facilitating narrative, whereas Gods of the Plague is a story driven affair in which the melancholy affect is just a necessary ingredient. In cool, sterilized black and white, recalling Herzog’s similarly early effort Signs of Life, Gods loosely continues the Franz story, here as a troubled ex-con recently released from prison and quickly descending back into the criminal life. His tempestuous relationship with his environment is played out through his complicated relationship with two women, Fassbinder regulars Hanna Schygulla and Margarethe von Trotta. If Gods is cold it’s also sullen and a bit melancholy, proving the director’s expressive mastery. In The American Soldier, Fassbinder’s fascination with American genre continues, here with another expressionistic noir peppered with the stylistic flourishes of the New Wave directors he most admired. An unofficial closing to his crime trilogy, The American Soldier follows a hit man as he navigates the existentially murky terrain of crime and passion. He moves through the world with typical Fassbinderesque alienation and quietude, his only interactions handled with robotic precision, even with family. This isn’t a straight up noir, of course: the main elements are there, such as antiheroes, ulterior motives, etc, but Fassbinder’s revisionist exercise showcases themes he’d continue to employ throughout his career. The last film collected here, Beware of a Holy Whore, is also the most intriguing, at least from an auteuristic glance. It’s a film about filmmaking and the only film here in color -- both of which should increase the interest factor for Fassbinder devotees. Never one to shy away from self-reflexivity or criticism, Fassbinder incorporates some of his arduous backstage experiences making Whity (1971) as the fodder for this film about the making of a film. As far as narrative goes there isn’t much outside the process of getting a film made. What delights is the interpersonal hilarity, often so crude or harsh that it’s clear that the scenarios came from personal experience. It’s a thematic anomaly in Fassbinder’s catalogue, which makes it even more interesting. Along with Herzog and Schlondorff, Fassbinder is often hailed as one of the forerunners of the German New Wave. His style was singular from the very beginning in that, unlike other filmmakers, he never seemed interested in grasping for commercial success. What’s onscreen is a clear extension of his bombastic personality. As with other Eclipse collections, there’s a paucity of special features. The essays contained within each film are informative and insightful, but the real reason to purchase this is to look into the inception of a madman’s creative process.